Back when I was doing papercrafts, my friends and I got together once per month to do scrapbooks, cards, art journals, etc. The group started a year or two before I joined, which was in 2007. So I've been with this wonderful group of women for NINE years now! We lost one member who moved away and another member moved but not so far, so still joins us very occasionally. We're down now to six, which is really a manageable number since we meet in each others' homes. The change however is that we no longer do papercrafts. We're all into sewing now: bags, placemats, fabric boxes, mug rugs, wall hangings, or other sewing projects. A couple of us are eager to start sewing clothes, but for now are content to just do our "projects". We're no longer meeting for "crops" (a papercraft term) but now meet for "Craft Day"! 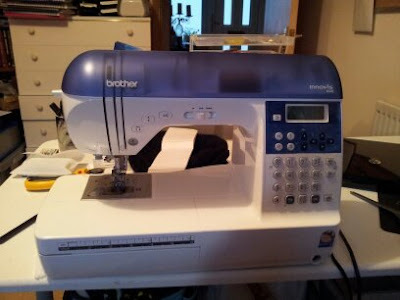 First, of course, is my sewing machine. Currently, it's a Brother Innovis 600, which they don't even make anymore. As far as I can tell, it's almost identical to the Brother Innovis 350SE. I have no plans to upgrade at the moment as I really love my 600. The husband of one of my crafter buddies said we look like the sewing room in the show "Mr. Selfridge" when we all start sewing on our machines! That or some kind of backstreet sweatshop, I suppose. And we all use different machines! Then of course, we all bring our various "tools of the trade". Some of us use an assortment of bags, but I have a plastic storage caddy. I leave my supplies in it all the time, even when working at home. That way I know where everything is and don't have to go rifling through drawers and boxes to find something.... just pick it up and go. The photos are in reverse order: bottom layer to top layer. The contents of the bottom tray change, depending on the project at hand. For example, for the last craft day I made something out of Debbie Shore's "Sew Inspired" magazine. I cut the fabric out before I went, so that saved time and space. fabric clips, and various other odds and ends. These are too large or too odd-shaped to go into the top tray. It may look a little chaotic, but I know exactly what I have. The top tray has movable compartments. I keep small items in here, sorted by the type of item. For example, all machine needles are together, tape measures, etc. It really is a very workable system. The only problem with the plastic caddy is that the little snaps break very easily. Mine have broken in a couple of places, so I have to be very careful when all three trays are snapped together and I need to carry it. I can replace or add to the trays, although they aren't particularly cheap! I usually have to also carry a tote bag for large items, such as a very long ruler, a bag of poly stuffing, magazines/books, and my lunch. I think everyone ought to have some friends to craft with. We learn so much from each other and get so much help from each other, too. To see what kinds of projects we do, you can scroll back through this blog. I haven't put everything here but a good sample. I would love to hear how you craft: where, when, with whom, and with what kinds of tools. Please leave some comments if you want to share. Thanks.